Friedrichs v. California Teachers Association could result in the defunding of public-sector unions. Back in the old days, unions could get crushed easily with police crackdowns and armed thugs. These days, business conducts its union busting the civilized way, in court and at the bank. 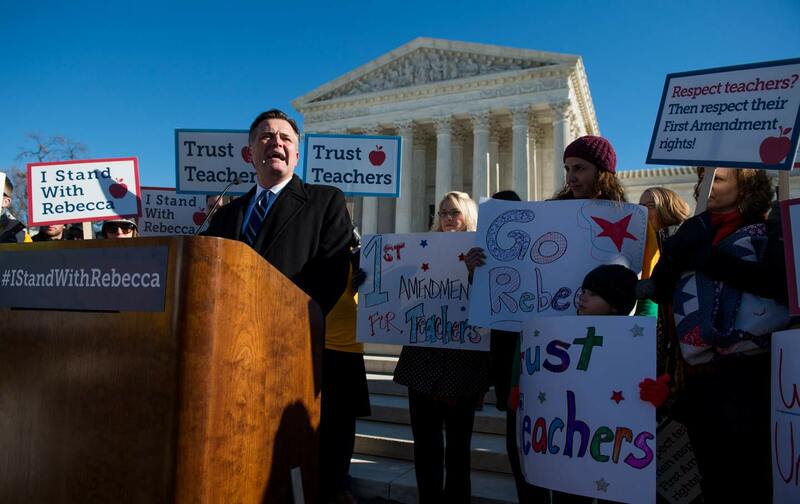 The question before the Supreme Court last week in Friedrichs v. California Teachers Association wasn’t about free speech or workers’ rights on the job so much as it was about the right of unions to exist as financial and legal institutions. The conflict before the court, according to conservatives, is a tale of Big Labor’s oppressive reign over civil servants: Rebecca Friedrichs, an ordinary California schoolteacher, says her union’s agenda is violating her First Amendment rights. But the case fundamentally has little to do with free expression, and it has lots to do with fair payment for a vital service. And paradoxically, a single teacher’s reluctance to pay her fair share to the organization that negotiates her job contract is silencing the voice all public-sector workers, as the court considers a policy that would defund their unions. Yet the precedent that the Friedrichs case could overturn, Abood v. Detroit Board of Education, protects more than just the institutional role of unions. With a union membership rate of about one in three, public sector unionization is today much stronger than private-sector union representation, which has dwindled to under 7 percent. Ensuring labor’s power in government agencies and public services is critical for ensuring equity in both the work that government does and the workforce that executes public policy. The pro-labor side would agree with the conservatives that constitutional rights are at issue—not because unions threaten freedom expression, but because labor power is fundamental to democratic values. The increasing concentration of political power in the hands of a moneyed elite shows how democracy suffers in an intensely unequal society, and conversely, how economic justice, workplace justice, and representative government are interlinked. As Richard Kahlenberg of The Century Foundation writes, Friedrichs “pits the right of public employees to band together and form effective unions to pursue the common interests of workers against the free speech rights of dissenting public employees” who simply don’t agree with their union’s political stance and therefore feel justified in withholding funds from it. The relatively narrow anti-labor ruling that the Supreme Court issued in Harris v. Quinn last year dealt with a unique subset of public-sector work—home care aides paid by the government but working for families—and that reading could be dramatically expanded in Friedrichs, which deals with a far more common workplace: public schools. To underscore the absurdity of their proposition that non-union public workers are “oppressed” by collective bargaining, Andrew Strom at OnLabor.org points out that the San Luis Obispo teachers’ contract to which Friedrichs objected “provides that all teachers are entitled to a duty free lunch period of at least 30 minutes.” Between union fees and free lunch breaks, he writes, “it’s possible that some teachers wish they had to work through lunch, but it seems unlikely.” Similarly, while the plaintiffs argue “class size is ‘a hotly debated policy issue,’ Strom notes, “I’ve never heard a teacher complain about not being allowed to teach larger classes.” The kind of freedom the “right to work” serves is the same force attacking the tyranny of Social Security and Medicare taxes that keep aging people from dying in miserable poverty. As Justice Antonin Scalia contended in oral arguments, the closed-shop rule applies differently to government-run workplaces, “where every matter bargained for is a matter of public interest.” But to civil-rights groups siding with labor in Friedrichs, the public interest should be at stake, simply because it’s a union’s job to stand up for workers charged with providing for the public good. And using Scalia’s logic, if a government employee is somehow oppressed when part of her wages are used to subsidize a union, then why does the union even have the right to represent her at all? University of California–Irvine Law professor Catherine Fisk argues that the challenge to “compelled” fees might crack open the door to challenging the notion of a closed shop, effectively pitting the First Amendment against the concept of exclusive representation in all unionized government workforces. Yet Friedrichs and Harris revolve around specific workforces with social functions that point to the ulterior motives behind the right’s “free speech” objections to unions. Both education and home healthcare are extremely gendered work sectors (mainly done by women, increasingly immigrants and women of color), and their workers bridge public welfare with private households, by supporting the health and intellectual development of families. By severing union ties to these public sector workplaces, that’s making them inherently less democratic. Carrying out your job and getting compensated fairly for it shouldn’t be a political issue, but in an economy that systematically disempowers public servants, fairness at work becomes politicized. Sometimes it costs a little to stand up for basic rights at work—whether in the form of monthly fees, or committing not to cross a picket line. Supporting a union that watches out for workers is a small shield against a system bent on robbing us blind.